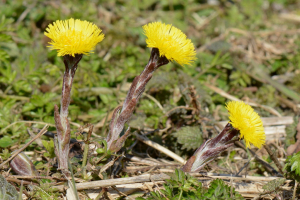 Observation - Colt's-foot - UK and Ireland. Description: It must be a good year for Colts-foot as in places you had to look where you were treading owing to the amount of flowers. Nice to see in our rather delayed spring, a welcome splash of colour. It must be a good year for Colts-foot as in places you had to look where you were treading owing to the amount of flowers. Nice to see in our rather delayed spring, a welcome splash of colour.